Comelit Bravo Intercom Kit is the video entry phone for your electric gates with a simple and elegant design, adaptable to all types of homes. Each detail has been created to ensure elegance, functionality and simple management. 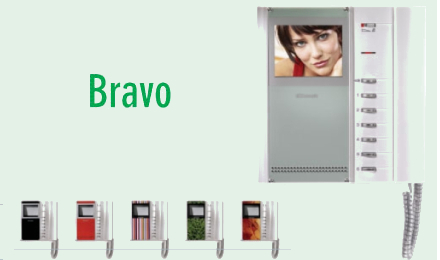 The chrome keys, the silver/plated cord, which can be inserted in plug mode, the white gloss colour combined with the silver colour bottom cover, and the finish like etched glass, are just some of the details which make Comelit Bravo an exclusive reference point in the sector. 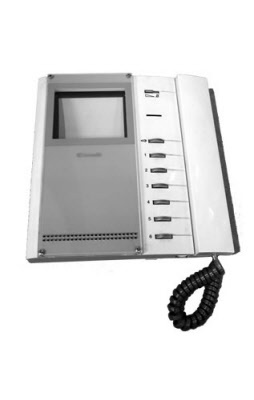 The Comelit Video Intercom monitor (colour or B/W) is able to satisfy all aesthetic and functional requirements. It is available in 2 versions: handset and hands/free. Coloured templates allow personalisation of the monitor, adapting it to all tastes. Bravokit is the new, simple, intercommunicating and versatile Comelit video entry kit.Thought up on the basis of the exclusive Comelit Simplebus technology, it is the absolute benchmark of simplicity.It consists of the Powercom, entrance panel, with its unmistakeable blue LEDs and its clearcut and original design, and of Bravo, the new video entry phone with an elegant line,adaptable to all types of homes. The kit includes:- a monitor Bravo art. 5701- a bracket 5714/K- a transformer art. 1205/B- an external unit art. 4875/BK- a branch terminal art. 1214/2- a termination terminal art. 1216.